10:50 I don't have any hard and fast rules for trading the MoonTideTracker, but that is one example. but it could be a bug- so not much trading to do until after noon. 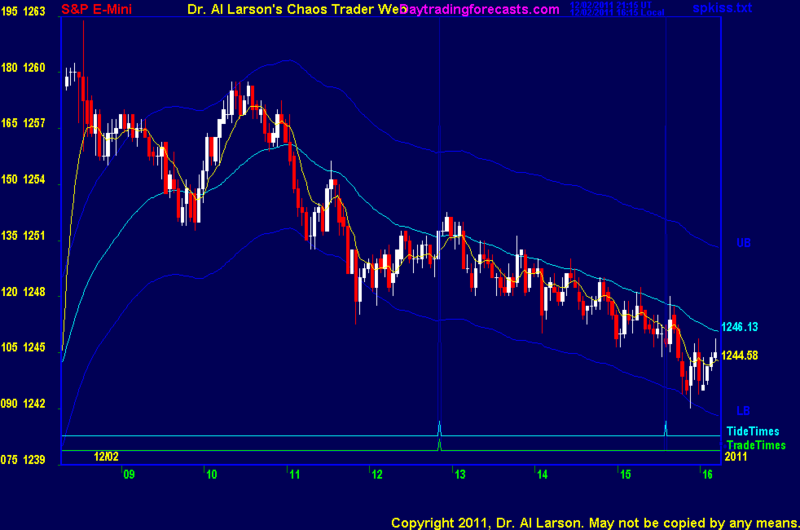 12/2/2011 11:44:28 AM MT BBB****:: So I am guessing you were more apt to trade long on the FOP and the tide tracker. But when stepping back and looking at the long, with the 110 so decisively down on 1m and 3m charts, would it have been more prudent to wait for a confirmed turn on EMAs? 12/2/2011 9:25:38 AM MT AG:: Price tracking -XTide2Plus extremely well. 12/2/2011 8:42:13 AM MT BBB****:: Nice trade Al. 12/2/2011 7:37:36 AM MT BBB****:: Morning, good luck today. 12/2/2011 4:24:50 AM MT Tg****:: Hi Al, sometimes I love your software algorithm for choosing the tidetimes and sometimes it leaves me scratching my head wondering what's going on. Today for instance looks like an overnight tide time near 6:15 AM EST and clearly one in the afternoon at 12:51 EST but in between those two there certainly appears to be one between 9:40 and 10:40 AM EST. Do you think that turn was simply to broad a turn for the algorithm to choose a good morning tide time?